Hot weather, possibly close to the hottest weather of the season is on tap over the next two weeks. This should help make corn stalks brown up fast. However, with that heat, high dewpoints or moisture will also accompany the hot weather. This means soil drying will be slower than you would normally expect with high temperatures due to a limit on the evapotranspiration rate. The hot weather will be fueled in part by tropical activity in the Pacific Ocean driving storms into the Pacific Northwest into western Canada and a big high pressure over the eastern U.S. Rainfall will likely continue at or above normal into the start of September before some drying occurs. We do not see any early freeze conditions this year. Field Conditions/Soil Moisture: 1-2 inches of extra moisture in soils so expect okay conditions for harvest except in lower areas that will likely remain wet. Field Conditions/Soil Moisture: 1-2 inches of extra moisture in the soils and with some rainy weather some challenges can be expected in harvest. Wettest conditions will be western half and northern areas driest east and southeast. 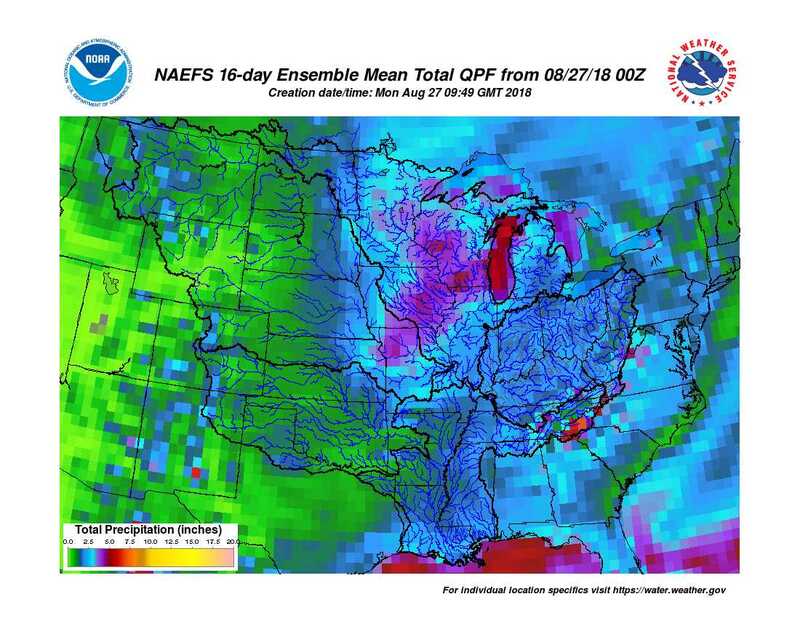 The next two weeks of rainfall can be seen on attached image. Normal is about 0.75 inches per week. Normal for two weeks is about 1.5 inches and the weather models suggest the rainfall will average 1.25 to 3+ inches over Ohio for the next two weeks. The biggest rain threats the next two weeks will be over parts of Minnesota, Wisconsin and Iowa where rainfall could top a half foot and create real wet soil conditions in those areas.